Are you looking for the named players of all the 24 teams for this summer's Euro 2016 tournament? Find here all the confirmend 23-men squads, grouped by role and groups. Goalkeepers: Etrit Berisha (Lazio), Alban Hoxha (Partizani), Orges Shehi (Skenderbeu). Defenders: Elseid Hysaj (Napoli), Lorik Cana (Nantes), Arlind Ajeti (Frosinone), Mergim Mavraj (Koeln), Naser Aliji (Basel), Ansi Agolli (Karabag), Frederik Veseli (Lugano). Midfielders: Ermir Lenjani (Nantes), Andi Lila (Giannina), Migjen Basha (Como), Ledian Memushaj (Pescara), Burim Kukeli (Zurich), Taulant Xhaka (Basel), Ergys Kace (Paok), Amir Abrashi (Freiburg), Odise Roshi (Rijeka). Forwards: Bekim Balaj (Rijeka), Sokol Cikalleshi (Medipol Basaksehir), Armando Sadiku (Vaduz), Shkelzen Gashi (Colorado Rapids). Goalkeepers: Robert Almer (Austria Vienna), Heinz Lindner (Eintracht Frankfurt), Ramazan Ozcan (Ingolstadt). Defenders: Aleksandar Dragovic (Dinamo Kiev), Christian Fuchs (Leicester City), Gyorgy Garics (Darmstadt), Martin Hinteregger (Borussia Monchengladbach), Florian Klein (Stuttgart), Sebastian Prodl (Watford), Markus Suttner (Ingolstadt), Kevin Wimmer (Tottenham Hotspur). Forwards: Lukas Hinterseer (Ingolstadt), Rubin Okotie (1860 Munich), Marc Janko (Basel). Goalkeepers: Thibaut Courtois (Chelsea), Simon Mignolet (Liverpool), Jean-Francois Gillet (Mechelen). Defenders: Toby Alderweireld (Tottenham), Jan Vertonghen (Tottenham, Thomas Vermaelen (Barcelona), Jason Denayer (Galatasaray), Jordan Lukaku (Oostende), Thomas Meunier (Club Brugges), Laurent Ciman (Montreal Impact), Christian Kabasele (Genk). Midfielders: Moussa Dembele (Tottenham), Radja Nainggolan (Roma), Marouane Fellaini (Manchester United), Axel Witsel (Zenit St Petersburg), Eden Hazard (Chelsea), Kevin De Bruyne (Manchester City), Dries Mertens (Napoli), Yannick Carrasco (Atletico Madrid). Forwards: Mitchy Batshuayi (Marseille), Romelu Lukaku (Everton), Christian Benteke (Liverpool), Divock Origi (Liverpool). Midfielders: Dele Alli (Tottenham), Ross Barkley (Everton), Eric Dier (Tottenham), Jordan Henderson (Liverpool), Adam Lallana (Liverpool), James Milner (Liverpool), Raheem Sterling (Manchester City), Jack Wilshere (Arsenal). Goalkeepers: Benoit Costil (Rennes), Hugo Lloris (Tottenham), Steve Mandanda (Marseille). Defenders: Lucas Digne (Roma), Patrice Evra (Juventus), Christophe Jallet (Lyon), Laurent Koscielny (Arsenal), Eliaquim Mangala (Manchester City), Adil Rami (Sevilla), Bacary Sagna (Manchester City), Samuel Umtiti (Lyon). Midfielders: Yohan Cabaye (Crystal Palace), Morgan Schneiderlin (Manchester United), N'Golo Kante (Leicester), Blaise Matuidi (Paris Saint-Germain), Paul Pogba (Juventus), Moussa Sissoko (Newcastle). Forwards: Kingsley Coman (Bayern Munich), Andre-Pierre Gignac (Tigres), Olivier Giroud (Arsenal), Antoine Griezmann (Atletico Madrid), Anthony Martial (Manchester United), Dimitri Payet (West Ham). Goalkeepers: Gabor Kiraly (Haladas), Denes Dibusz (Ferencvaros), Peter Gulacsi (Leipzig). Defenders: Attila Fiola (Puskas Akademia), Barnabas Bese (MTK), Richard Guzmics (Wisla Krakow), Roland Juhasz (Videoton), Adam Lang (Videoton), Tamas Kadar (Lech Poznan), Mihaly Korhut (Debrecen). Midfielders: Akos Elek (Diosgyori), Adam Pinter (Ferencvaros), Zoltan Gera (Ferencvaros), Adam Nagy (Ferencvaros), Laszlo Kleinheisler (Werder Bremen), Gergo Lovrencsics (Lech Poznan), Zoltan Stieber (Nurnberg). Forwards: Balazs Dzsudzsak (Bursaspor), Adám Szalai (Hannover), Krisztian Nemeth (al-Gharafa), Nemanja Nikolic (Legia Warsaw), Tamas Priskin (Slovan Bratislava), Daniel Bode (Ferencvaros). Goalkeepers: Hannes Halldorsson (Bodo/Glimt), Ogmundur Kristinsson (Hammarby), Ingvar Jonsson (Sandefjord). Defenders: Ari Skulason (OB), Hordur Magnusson (Cesena), Hjortur Hermannsson (PSV Eindhoven), Ragnar Sigurdsson (Krasnodar), Kari Arnason (Malmo), Sverrir Ingi Ingason (Lokeren), Birkir Sævarsson (Hammarby), Haukur Heidar Hauksson (AIK). Midfielders: Emil Hallfredsson (Udinese), Gylfi Sigurdsson (Swansea), Aron Gunnarsson (Cardiff), Theodor Elmar Bjarnason (AGF), Arnor Ingvi Traustason (Norrkoping), Birkir Bjarnason (Basel), Johann Gudmundsson (Charlton), Eidur Gudjohnsen (Molde), Runar Mar Sigurjonsson (Sundsvall). Forwards: Kolbeinn Sigthorsson (Nantes), Alfred Finnbogason (Augsburg), Jon Dadi Bodvarsson (Kaiserslautern). Defenders: Craig Cathcart (Watford), Jonny Evans (West Brom), Gareth McAuley (West Brom), Luke McCullough (Doncaster), Conor McLaughlin (Fleetwood), Aaron Hughes (Melbourne City), Lee Hodson (MK Dons), Chris Baird (Derby County), Paddy McNair (Manchester United. Goalkeepers: Lukasz Fabianski (Swansea), Wojciech Szczesny (Roma), Artur Boruc (Bournemouth). Defenders: Thiago Cionek (Palermo), Kamil Glik (Torino), Artur Jedrzejczyk (Legia), Michal Pazdan (Legia), Lukasz Piszczek (Dortmund), Bartosz Salamon (Cagliari), Jakub Wawrzyniak (Lechia Gdansk). Midfielders: Jakub Blaszczykowski (Fiorentina), Kamil Grosicki (Rennes), Tomasz Jodlowiec (Legia), Bartosz Kapustka (Cracovia), Grzegorz Krychowiak (Sevilla), Karol Linetty (Lech Poznan), Krzysztof Maczynski (Wisla), Slawomir Peszko (Lechia Gdansk), Filip Starzynski (Zaglebie Lubin), Piotr Zielinski (Empoli). Goalkeepers: Rui Patrício (Sporting CP), Anthony Lopes (Lyon), Eduardo (Dínamo Zagreb). Defenders: Vieirinha (Wolfsburg), Cédric (Southampton), Pepe (Real Madrid), Ricardo Carvalho (Monaco), Bruno Alves (Fenerbahçe), José Fonte (Southampton), Eliseu (Benfica), Raphael Guerreiro (Lorient). Midfielders: William Carvalho (Sporting CP), Danilo Pereira (Porto), João Moutinho (Monaco), Renato Sanches (Benfica), Adrien Silva (Sporting CP), André Gomes (Valencia), João Mário (Sporting CP). Forwards: Rafa Silva (Braga), Ricardo Quaresma (Besiktas), Nani (Fenerbahçe), Cristiano Ronaldo (Real Madrid), Éder (Lille). Goalkeepers: Shay Given (Stoke), Darren Randolph (West Ham), Keiren Westwood (Sheffield Wednesday). Defenders: Sergio Ramos (Real Madrid), Gerard Pique (Barcelona), Dani Carvajal (Real Madrid), Jordi Alba (Barcelona), Marc Bartra (Barcelona), Cesar Azpilicueta (Chelsea), Mikel San Jose (Athletic Bilbao), Juanfran (Atletico Madrid). Goalkeepers: Matúš Kozácik (Viktoria Plzen), Ján Mucha (Slovan Bratislava), Ján Novota (Rapid Wien). Defenders: Peter Pekarík (Hertha Berlin), Milan Škriniar (Sampdoria), Martin Škrtel (Liverpool), Norbert Gyömbér (Roma), Ján Durica (Lokomotiv Moskva), Kornel Saláta (Slovan Bratislava), Tomáš Hubocan (Dinamo Moskva), Dušan Švento (Köln). Midfielders: Marek Hamšík (Napoli), Juraj Kucka (AC Milan), Miroslav Stoch (Bursaspor), Vladimír Weiss (Al-Gharafa), Róbert Mak (PAOK), Patrik Hrošovský (Viktoria Plzen), Ján Greguš (Jablonec), Viktor Pecovský (Žilina), Stanislav Šesták (Ferencváros), Ondrej Duda (Legia Warszawa). Forwards: Michal Duriš (Viktoria Plzen), Adam Nemec (Willem II). Goalkeepers : Roman Buerki (Borussia Dortmund), Marwin Hitz (Augsburg), Yann Sommer (Borussia Moenchengladbach). Goalkeepers: Andreas Isaksson (Kasimpasa), Robin Olsen (Copenhagen), Patrik Carlgren (AIK). Defenders: Ludwig Augustinsson (Copenhagen), Erik Johansson (Copenhagen), Pontus Jansson (Torino), Victor Lindelof (Benfica) Andreas Granqvist (Krasnodar), Mikael Lustig (Celtic), Martin Olsson (Norwich). Midfielders: Jimmy Durmaz (Olympiakos), Albin Ekdal (Hamburg), Oscar Hiljemark (Palermo), Sebastian Larsson (Sunderland), Pontus Wernbloom (CSKA Moscow), Erkan Zengin (Trabzonspor), Oscar Lewicki (Malmo), Emil Forsberg (Leipzig), Kim Kallstrom (Grasshoppers). 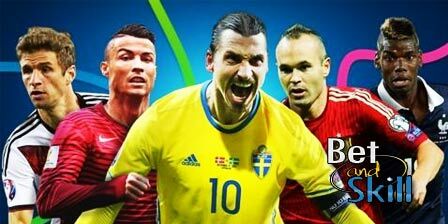 Forwards: Marcus Berg (Panathinaikos), John Guidetti (Celta Vigo), Zlatan Ibrahimovic (Paris), Emir Kujovic (Norrkoping). Goalkeepers: Harun Tekin (Bursaspor), Onur Kivrak (Trabzonspor), Volkan Babacan (Istanbul Basaksehir). Defenders: Gökhan Gönül (Fenerbahçe), Sener Özbayrakli (Fenerbahçe), Ahmet Çalik (Gençlerbirligi), Hakan Balta (Galatasaray), Mehmet Topal (Fenerbahçe), Semih Kaya (Galatasaray), Caner Erkin (Fenerbahçe), Ismail Köybasi (Besiktas). Midfielders: Emre Mor (Nordsjælland), Volkan Sen (Fenerbahçe), Hakan Çalhanogu (Bayer Leverkusen), Nuri Sahin (Borussia Dortmund), Oguzhan Özyakup (Besiktas), Ozan Tufan (Fenerbahçe), Selçuk Inan (Galatasaray), Arda Turan (Barcelona), Olcay Sahan (Besiktas). Forwards: Burak Yilmaz (Beijing Guoan), Cenk Tosun (Besiktas), Yunus Malli (Mainz). Midfielders: Anatoliy Tymoschuk (Kairat Almaty), Oleksandr Karavaev (Zorya), Andriy Yarmolenko (Dynamo Kiev), Denys Garmash (Dynamo Kiev), Serhiy Sydorchuk (Dyamo Kiev), Serhiy Rybalka (Dynamo Kiev), Taras Stepanenko (Shakhtar Donetsk), Viktor Kovalenko (Shakhtar Donetsk), Ruslan Rotan (Dnipro), Yevhen Konoplyanka (Sevilla). Goalkeepers : Wayne Hennessey (Crystal Palace), Danny Ward (Liverpool), Owain Fon Williams (Inverness). Defenders: Ben Davies (Tottenham), Neil Taylor (Swansea), Chris Gunter (Reading), Ashley Williams (Swansea), James Chester (West Brom), Ashley Richards (Fulham), James Collins (West Ham). Midfielders: Aaron Ramsey (Arsenal), Joe Ledley (Crystal Palace), David Vaughan (Nottingham Forest), Joe Allen (Liverpool), David Cotterill (Birmingham), Jonathan Williams (Crystal Palace), George Williams (Fulham), Andy King (Leicester), Dave Edwards (Wolves). Forwards: Gareth Bale (Real Madrid), Hal Robson-Kanu (Reading), Sam Vokes (Burnley), Simon Church (Nottingham Forest). "Euro 2016 named players: all the 24 teams, role by role"